Don't be deceived by the title of Steve Marantz's terrific new boxing book, "Sorcery at Caesars: Sugar Ray's Marvelous Fight." Marantz, a longtime Boston journalist who covered boxing for the Globe, pulls no punches of his own in letting the reader know which fighter he was pulling for when Brockton's Marvelous Marvin Hagler and Sugar Ray Leonard squared off in their epic title bout on April 6, 1987, in Las Vegas. Marantz wanted to see the angry, shaven-headed Hagler wipe the perpetual smile off of Leonard's famous pretty-boy mug. Of course, as anyone who followed boxing when boxing actually mattered knows, things didn't quite work out for the Marvelous one. Surprisingly, the weakest part of the book may be its climax, the 12-round fight between a legitimate middleweight brawler known for being able to take a punch even better than he could deliver one and the aging, puffed-up welterweight from Washington, D.C., named after singing legend Ray Charles. The underdog Leonard saw Hagler as the perfect foil against whom to conclude his golden career, but the fight details almost go by too quickly, with not enough analysis of the blow-by-blow to fully convey how Leonard accomplished what he did. Fortunately, by the time readers get to the fight, they will be so engrossed in the back story of what led up to it that the punching almost feels anticlimactic. Marantz does a terrific job of bringing to life the vastly different stories of these two proud but troubled men who came together for one night of brawling and bloodshed. The details of Leonard's drug and spousal abuse reveal him to be as two-faced as Marantz argues, a man who was married more to his sport and the shady characters that come with it than he ever was to his family. And while Hagler certainly comes off as the more sympathetic character, it's hard to actually root for him because when the fight finally comes he's become almost a shell of his former self, someone who merely craves Leonard's fame. The book's strength is in the way Marantz takes readers inside Leonard's head as he first teases Hagler for years about a possible big-payday fight, finally agrees to it, and then does everything he can, no matter how sneaky, to weaken his opponent before they set foot in the ring. By the time the bell for Round 1 clangs, it feels as if Hagler is already burnt toast. The subject of possible drug use by Hagler is glossed over too lightly, because it remains not entirely clear how much he used, when he used, or for that matter, if he really used at all. The handling of the subject almost feels forced, as if Marantz wanted Hagler to have used drugs as Leonard had, so that their lives mirrored each other's as much as possible. That's nitpicking, though. In the end, it's hard to not feel sorry for both men, who finally got the fight they wanted, and to see how much it tormented them. Doug Most is the editor of the Boston Globe Magazine. 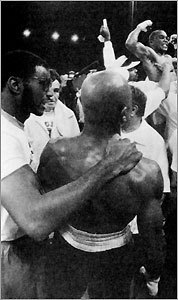 (Boston Globe File Photo) Journalist Steve Marantz explores the back story that led to Sugar Ray Leonard's victory in Las Vegas over Brockton's Marvelous Marvin Hagler on April 6, 1987 (above).